WASHINGTON — Alaska doesn't fare very well under the proposed Senate health care legislation: Many Alaskans are likely to face higher premium costs or less coverage, and the state would eventually have to make deep cuts to Medicaid coverage. It appears unlikely that the bill will offer the state relief from rising health insurance costs. Older, middle-class Alaskans buying insurance on the exchange are likely to face the highest cost jumps. Young Alaskans will be able to stay on their parents' health care plans until they turn 26, a popular provision of the Affordable Care Act. 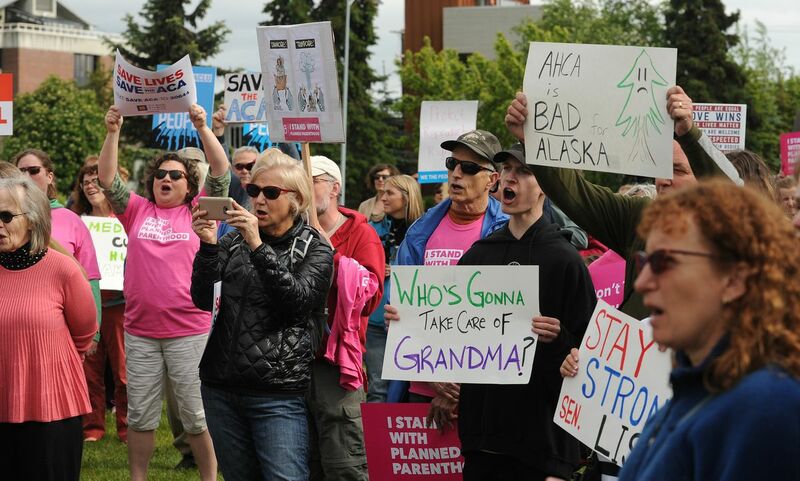 Alaskans who simply don't want insurance could be free to go their own way. Central to most Republicans' ACA wish lists, the Senate bill eliminates the requirement that most Americans either have insurance or pay a tax fine. Unlike the House bill, the Senate bill has nothing in it to urge continuous coverage. Under the ACA, the mandate to buy insurance was designed to draw generally healthy people into insurance markets to balance out the risk posed by the chronically ill. That way, people couldn't just take a pass on buying insurance until they get sick. Senate staffers said they were continuing to look for a way to alter the bill — within procedural rules — that would keep people from "gaming the system." As of this month, 185,139 Alaskans receive Medicaid services. That's 25 percent of the state's population. The Senate bill will, in the long term, dramatically restructure the way states and the federal government pay for Medicaid. In the end, no doubt, there will be far fewer Alaskans covered by Medicaid, and potentially fewer services. Alaska is one of 32 states (if you include the District of Columbia) that expanded Medicaid under the ACA. Previously, the program was only available to people living at the federal poverty limit, with exceptions for some pregnant women and children. That's a $15,060 annual salary for a single Alaskan and $30,750 for a family of four. Medicaid expansion boosted the potential Medicaid population to people making 138 percent of the poverty line, adding 33,945 Alaskans to the rolls by the end of May. Generally, Alaska splits the cost of Medicaid reimbursement with the federal government. But for the expansion population, the federal government covered 100 percent of their costs through the end of 2016, 95 percent currently, and the rate will drop to 90 percent in 2020. So far, the federal government has paid nearly $500 million in claims for just the expansion group in Alaska. The Senate bill changes the program, and in a way that is likely to come head to head with Alaska's high and rising health care costs. No longer will the federal government pay a proportion (usually 50 percent) of the Medicaid health care costs. Instead, it will offer states a capped amount per customer — a "per capita cap." The cap would rise each year, but tied to general inflation rates, not medical costs, according to Bob Greenstein, president of the Center on Budget and Policy Priorities. CBPP is a left-leaning "nonpartisan" think tank. But Alaska's Republican lawmakers have repeatedly cited its previous data on health care costs, particularly an analysis of the recent U.S. House health care bill. Medical costs historically rise faster than inflation, so as time goes by, the Medicaid cuts "grow bigger and bigger and bigger," Greenstein said. States could also opt for a lump sum, not tied to the number of people in the Medicaid program. Either way, "states would have no alternative but to make massive cuts" to Medicaid programs, Greenstein said. Depending on Alaska's choices, that could particularly impact the availability and quality of nursing home care for the elderly. Most older Alaskans get their health care through Medicare, which is not affected by the Senate bill. But assisted living, in-home care and nursing homes are funded separately, through Medicaid. The number of Alaskans age 85 and older is expected to rise 135 percent by 2030, the largest boost in the country, according to the Kaiser Family Foundation. Medicaid cuts could also cut into Alaska's ongoing efforts to combat the state's opioid epidemic by using the program to treat addicted Alaskans. The bill does include a $2 billion grant program for 2018, though it falls far short of what some lawmakers hoped to see in the bill. Given how important such programs are to many rural and Republican-dominated states, that is a "fix" likely to be made to the bill over the next week, experts say. Relative to Medicaid, a small percentage of Alaskans are buying their insurance on the ACA exchange — just over 19,000 Alaskans. About 88 percent of them are currently receiving subsidies. Those subsidies, and the number of Alaskans who receive them, would drop under the Senate's proposed legislation. Since Alaska has some of the highest costs — and premiums — in the nation, Alaskans will be more starkly affected by the changes in the Senate bill than any other state. Under the Affordable Care Act, people with middle-of-the-road incomes — 300 percent to 400 percent of the poverty line — get more help paying premiums in high-cost states. The Senate's plan removes those payments, so those people are likely to be hit harder. A 60-year-old making an income that is 300 percent of the poverty line — about $45,000 a year in Alaska — would see his premiums rise, after tax credits, by $5,777 in Alaska, according to data compiled by the Center for Budget and Policy Priorities. But make just a bit more, and pay a whole lot more under the Senate plan, CBPP's numbers show. Under the Senate bill, a 60-year-old Alaskan making $53,000 would lose $22,380 in subsidies received under the ACA. It is fair to assume that adding nearly half of one's salary to health care costs would make them unaffordable. 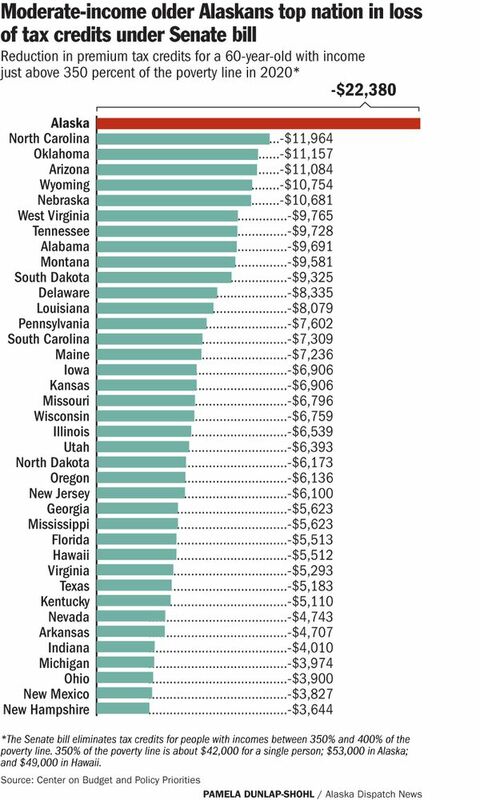 Because Alaska is such a high-cost state, that means that the ACA tax credits were highest, and in that category nearly double the No. 2 state, North Carolina. That 60-year-old could keep costs down by switching to a lower-cost plan that covers less of their medical costs. But premiums for those plans — particularly with much higher deductibles — could still go up, according to CBPP. Big loser in Senate health plan? A 64-year-old making ~$43K a year in Anchorage. Middle-class Alaskans may not go entirely without help under the Senate plan, but it would depend on how much help the state could nab under two relatively small pots of money offered through the law. To stabilize state markets, the bill creates two national funds. The first provides $15 billion annually starting in 2018, $21 billion from 2020 to 2021, and nothing after that. A second state stability fund offers $8 billion in 2019 and $14 billion in 2020 and 2021. In that fund, $5 billion of the funds must be used to reduce premiums. The amount available in the second fund drops to $4 billion by 2026. The Senate plan expands upon an existing waiver program — known by its statute call number, 1332 — to give states flexibility to find ways to drive down costs. In its new form, the program would allow states to opt out of requiring that plans include "Essential Health Benefits." The Senate bill would also allow governors to make decisions without requiring the state legislature's approval. The ACA's "Essential Health Benefits" provision — a requirement that insurance plans cover a list of 10 benefits including maternity, prescription drugs and preventive care — remains law, but there is a away around it. The bill allows states to drop those benefits if it is part of a "waiver" system to drop premium prices. Prior to enactment of the ACA, in areas where it was possible to purchase an independent plan, many of those benefits were not available, even for additional payment. Alaska's current insurance chief, Lori Wing-Heier, said of a similar provision under the House plan that Alaska is unlikely to drop such provisions aimed at providing more comprehensive coverage. Consequently, it's not clear how much of an impact the changes to the program would have on Alaska's health care costs. But the state would have some new options on hand. Alaska is actually an early adopter of the 1332 waiver process, through its "reinsurance" program. The state is waiting on approval, which the Trump administration is expected to grant, for its waiver, which will provide additional funding in exchange for the state's efforts to stabilize and shore up its exchange market. But when Alaska used the plan, the state couldn't use it to allow lower-quality plans into the market. The Senate bill defunds Planned Parenthood for one year. That would mean patients could no longer use Medicaid benefits at the group's clinics in Anchorage, Soldotna, Juneau and Fairbanks. Generally, the clinics serve about 7,000 Alaskans per year. Senior GOP Senate staff said Thursday that they are unsure whether the Senate parliamentarian will allow the provision under budget reconciliation rule. Their lack of confidence in the measure means that it could go away on its own next week before a vote. The Planned Parenthood provision would be a tough spot for Alaska Republican Sen. Lisa Murkowski, who has made clear that she is not OK with cutting funding to the organization, and has voted against it in the past. Clarification: This story originally said that the Senate bill did not include specific funding for medication-assisted therapy, a popular treatment for opioid addiction. There is a $2 billion opioid grant program, and states could use some of that funding for medication-assisted therapy. Thanks to Senator Dan Sullivan's office for the insight.